In addition to keeping the audience close the performance, you also want to keep the audience closer together. People laugh out loud more and applaud more when they are in large groups and in close proximity to one another. Laughter, applause, and excitement are contagious. If you are not sure how many people will be showing up to your event, put “RESERVED” signs on the BACK half of the room to gently force people to sit together in the tables or seats up front. You can then remove signs and open up tables if needed. A row of empty tables in the back will be less noticeable and distracting than a row of tables up front, or a room full of tables that are only half full. It may seem like an obvious statement to make, but the audience should be able to see what is happening on the stage. But, many times event planners don’t realize there is a problem seeing the stage until it is too late to do anything to correct it. Pillars or supports in a room can easily cause sightline issues. Make note of any potential obstructions as you consider event spaces and begin planning your room layout. A poorly lit stage can also make it hard for people to see that is going on. The stage area should be as bright as possible during the show. Stage lighting, if available, is always the best way to light a stage. 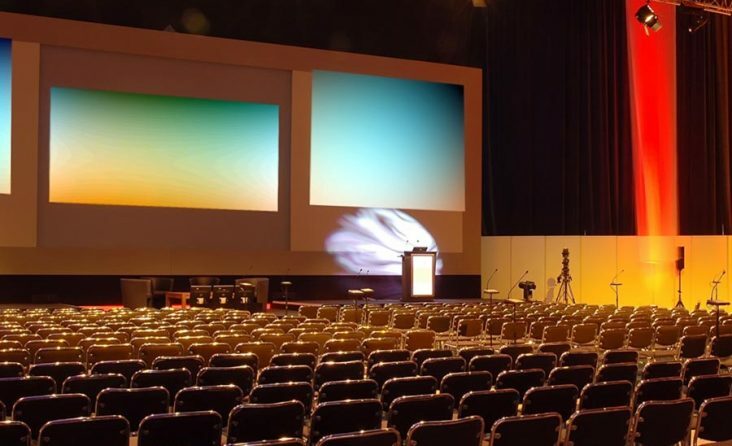 Many venues can arrange for stage lighting or spotlights for presentations. If stage lighting is not available, be prepared to turn up the room lighting in the area over the stage during the entertainment portion of your evening.. Most event managers at conference centers and banquet facilities will be more than happy to work with you to plan a room setup that works for the entertainment, meal and any other activities that might be happening at your event.